Many of you have asked what the partnership between Sustain & StruckSured looks like. I'd love to take some time to clarify our relationship and cooperative processes. To start from the beginning, Sustain has been serving the Gorge since 2007 and prior to that Heith, the owner, was busy as a drywall & clay finish professional. Over time clients would ask Heith if he was able to purchase and supply other materials for the projects he was working on and thus, Sustain was born. Sustain was always designed to be a one stop shop where clients would be able to walk in, get design assistance, select conscious and unique materials, and get connected to high quality installers. Towards the end of 2016, I decided to start publicly offering my services and was at the point where I needed an office. I began to search for an office in the Gorge and ended up looking into the offices within Sustain. After meeting Heith and Lorin (and some serious convincing on Heith's part) we decided to consider what it would look like to partner and work alongside each other, as two independent businesses within one house. I liked having autonomy and having my own business, and Heith didn't have the need for a full-time designer on staff so it made sense to work together. The phrase both Heith and I use frequently is "together but separate." If you are just needing materials and wanting to purchase locally, Sustain is great for being able to source those. If you need to work through the design and already have your materials partially selected and a builder on board, I am happy to work with you through the process. BUT, if you do want a complete, one-stop shop, for design through installation, we can do it all. We are both committed to high-quality and thoughtful design coupled with transparent project management and installation with integrity. So what does it mean when you want everything under one roof? It means that everything is contracted and done through Sustain, and Strucksured executes the design on their behalf. 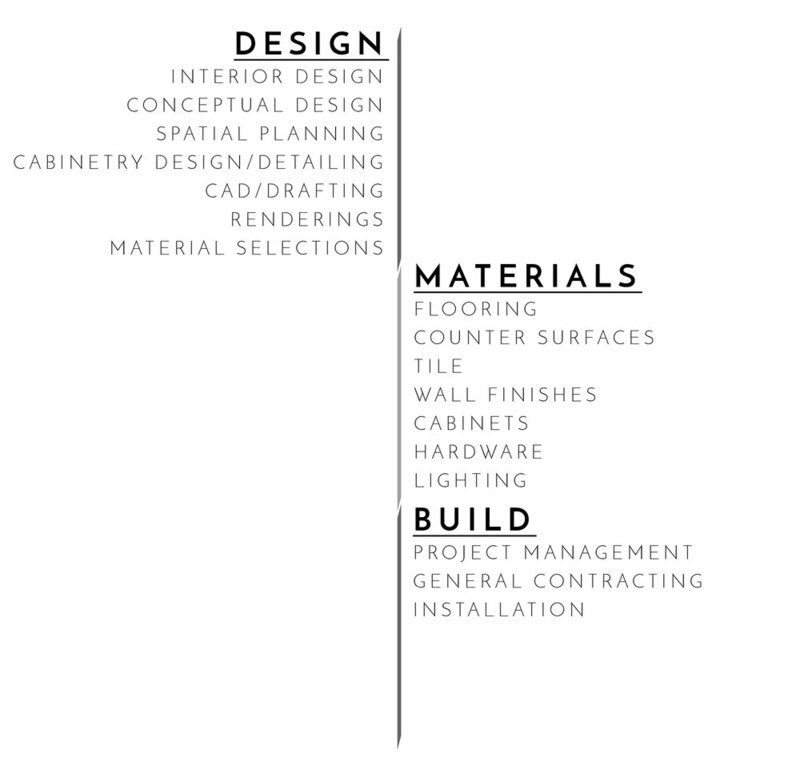 So, if you look at Sustain's site, you can see they offer DESIGN + MATERIALS + BUILD. I manage the Design side and Lorin and Heith manage the material and build side. We're the triple threat.... trifecta.... the Three Musketeers... Really, we just love working together to bring you thorough and creative design, unique products, and high quality installation. Still trying to understand what it looks like? Take a look below. So any service that falls on the LEFT is managed by myself. Anything that falls on the RIGHT is handled by Sustain. Whether you item or all the above, we are happy to help. Still have questions? Drop me a message or come on by to Sustain. We'd love to chat and help get you started.